To bring together those who have learned and practice Kriya Yoga as taught by Mahavatar Babaji and through the generations, his many teachers. This includes students of the great guru, Paramhansa Yogananda, as well as others, regardless of their teacher or source of training. It is also meant to bring together those who have learned other teachings then Kriya Yoga that have come to the fore under the ongoing direction of the deathless saint, Mahavatar Babaji. To offer a number of services to our Kriya family, including an organization resource directory, published writings, online discussion groups and an online yearly convention. For more information of our services see the section Here To Serve towards the bottom of this blog post. The Kriya Yoga Fellowship has been created at the behest of Mahavatar Babaji to bring together the students of Kriya Yoga. The great ones ask that we work together, understanding and appreciating our individual efforts which collectively enhance the good of all concerned and help bring to manifestation God’s Perfect Plan on earth. Rather then looking at our differences and thinking that one way or another is superior, let us appreciate our individual efforts in the same way that we appreciate a beautiful rainbow, seeing the beauty of the individual colors but also the magnificence from its inherent unity. From a practical point of view, our intention is really quite simple. The Kriya Yoga Fellowship wishes to offer a number of services to our Kriya family including a resource directory of Kriya based organizations, published writings, online discussion groups and an online yearly convention. 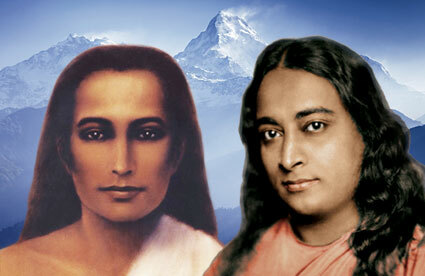 A link to the Kriya Yoga Resource Directory can be found in the column to the right of this blog. The directory includes the primary organizations that share the teachings of Kriya Yoga or at the very least, are guided by the inspiration of Mahavatar Babaji. Through the Inner Path online store we offer a section specifically dedicated to Kriya Yoga where you will find books, CD’s, aum boards and other supplies useful to those who practice Kriya Yoga. We also have a section specifically dedicated to the writings of Paramhansa Yogananda including, as much as possible, the published works of Yogananda’s original lessons and other earlier writings. With that purpose in mind we now offer the 1946 edition of Autobiography of a Yogi, the booklet, Yogoda or Tissue-Will System of Physical Perfection (which features his early work on what became the Energization Exercises), his Super Advanced Course Number One –Lessons 1 to 12, and the first version of Whispers From Eternity. Numerous other items (books, photos, CD’s, statuary, etc.) can also be found in the Yogananda section of the Inner Path Store. Additionally, the Fellowship seeks to publish as many first edition writings of Paramhansa Yogananda as we can, plus other important writings on Mahavatar Babaji and Kriya Yoga that are presently out of print. We are pleased to announce that we have just finished publishing Living Radiance – The Nutritional Teachings of Paramhansa Yogananda. Starting early next year we will begin an online study group for the reading and discussion of each of Yogananda’s three major writings, beginning with Autobiography of a Yogi. As you might imagine, a thorough reading of these books will take some years to complete, but when it’s over, we will have an important life-enriching understanding of these priceless teachings. To stay informed of the start of the study group, please consider signing on to our newsletter. And last but not least, the yearly online convention featuring speakers from numerous Yogananda and Kriya Yoga organizations is still in development. Our goal is to have the first convention in 2018.